German Shepherds are one of the most popular breeds of dog around. They’re loved for their long, fluffy fur, loyal nature and incredible intelligence. Often used as police and war dogs, german shepherds have a reputation that precedes them, which means that a lot of people have some interesting questions about the breed. However, if there is one thing more loyal and devoted than a German Shepherd, it’s their owners and they will stand up for their beloved hounds no matter what. So, here’s your guide to the 12 questions you should never ask a german shepherd owner. #1 - Aren't They Aggressive? German Shepherd Dogs are frequently stereotyped as being aggressive and out of control dogs, but this reputation is completely unfounded. They can be trained to be protective dogs and also to guard, which makes them excellent workers in the police force and in war zones. However, they aren’t naturally aggressive dogs and with good training and socialization, they are as loving and friendly as the next dog. #2 - They Don't Get Along With Other Dogs, Do They? 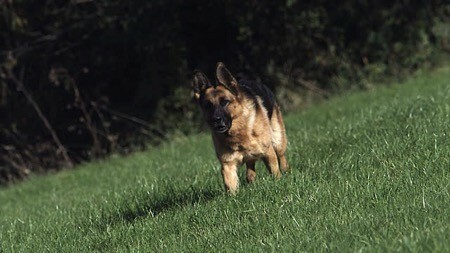 Perhaps because of their unfounded reputation as being aggressive, many people think that German Shepherds don’t like other dogs. That’s simply not true! Just take a look at German Shepherd Twitch letting her best friend Sophie out of her kennel. #3 - Do They Shed Much? Asking if a German Shepherd sheds is like asking if ice cream is cold. Undoubtedly the answer is yes. You only need to stroke a GSD to end up with a fist full of fur, but the german shepherd owner doesn’t care about that - it’s just the price to pay for having an awesome canine companion. #4 - Weren't They Bred As Attack Dogs? Nope. The clue is in the name! The German Shepherd was originally bred to herd and look over flocks of sheep. Now, they are bred as pets or as working dogs. #5 - Are They Brave Dogs? #6 - Wouldn't You Prefer a Small Dog That You Can Cuddle? Who says that a German Shepherd can’t cuddle? Whoever it is, better not tell them or their owners! Despite their size, German Shepherds love to snuggle up with their owners and genuinely think that they are lap dogs. They just want to be as close to their much-loved humans as possible, and often that means sneaking up to their knee to settle in for the evening. #7 - Aren't They Better As Outside Dogs? They may originally be working dogs, but the average German Shepherd is a pet that wants to be close to its family at all times. They can be like a shadow to their owners, and all they want in life is to hang out with their loved ones. Would you make a family member live outside? Of course not. 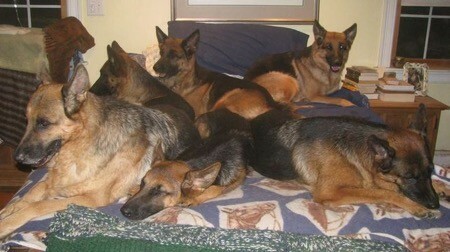 GSDs will only get bored and lonely left outdoors all day, they deserve to be inside with everyone else! #8 - Dogs Shouldn't Be Given Jobs Though, Should They? The German Shepherd is an incredibly smart breed of dog, and they can get bored easily if they don’t have something to do. GSDs bred to work have more energy and love to have a job as it keeps them stimulated physically and mentally. Dogs bred to be pets don’t need quite as much stimulation but they will thrive if they are given little jobs to do; it could be as simple as playing fetch or having a line up of tricks to do, or they could practice a sport such as agility, canine cross training or fly ball. #9 - You Won't Get Another One, Will You? Once you have one German Shepherd, you love them all. It can be hard to resist the temptation to keep adding the loveable breed to your family. #10 - Don't You Find The Breed Intimidating? German Shepherds are loving, sweet, family oriented dogs. They look adorable and are loyal to the end. Intimidating? Not so much. #11 - Surely You Don't Let Her On Your Bed? There comes a time in every German Shepherd owner’s life when they have to accept that their dog is going to be sleeping on the bed at every opportunity they get. After all, your bed is so much more comfortable than the dog bed - why should she have to settle for anything less? #12 - Did You Get Him To Make You Look Tougher? Due to the fact that German Shepherd Dogs have a reputation for being aggressive and overprotective, some people think that only an owner that wants to look tough would buy one. The truth is that German Shepherd owners want a dog that is loving, smart, beautiful, trainable, humorous and loyal. No dog is a fashion accessory or a status symbol, and the German Shepherd owner wants nothing more than to have the perfect family pet. So, have you ever been asked one of these questions, or maybe even something more silly? Feel free to share your story in our comments section!